For a while, I had been hunting for good sun protection for my face. Let us not forget that even in the winter (or Austin’s weak interpretation of it) you need to wear some kind of sun protection on your face. EVERYDAY. I was specifically looking for a physical sunblock, which is typically sensitive skin friendly. (If you’ve ever wondered what the difference is between “sunscreen” and “sunblock”, or “chemical” and “physical” sunblocks, read this.) The problem with sunblock formulas, however, is that they can leave a white cast on your skin due to the minerals used to do the sunblocking action. It’s not a good look. I had first seen the COOLA Suncare line at a trusted local beauty store, so I went online to further investigate their self-proclaimed organic products. 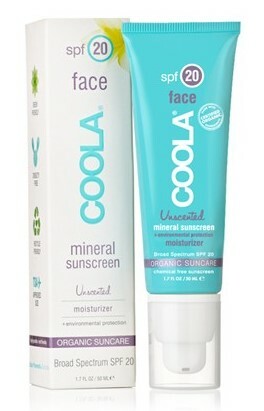 And then when Wendy and I went to Travaasa, their spa sold COOLA Face SPF20 Mineral Sunscreen, so I bought it in hopes that it would become my go-to daily sunscreen. The Good: The active ingredient in this COOLA sunblock is titanium dioxide, which is a physical, mineral sunblock, which means its safe for sensitive skin. The other benefit to using a physical sunblock is that you have instant sun protection, whereas with chemical sunscreens, it can take around 30 minutes to be effective. Also, that white cast problem I mentioned sometimes associated with sunblocks? Not a problem here, because this formula goes on very sheer, just as advertised. This sunscreen feels light and not at all heavy or greasy like some sunscreens, and my skin feels like it can breathe. Lastly, this product contains antioxidants (black tea and grape seed extract) that are a nice skincare bonus. The Questionable: This is not a cheap option for sun protection. It’s $36 for a 1.7oz tube, which is a little on the pricey end. The Verdict: I think this is an excellent choice for organic, good-for-you, mineral-based physical sun protection for your face. With this COOLA sunblock, I get a healthy dose of SPF20, and it works great under my favorite Armani Luminous Silk Foundation. While it’s a little pricey, you do get a lot of quality ingredients for your money. I think I’ll probably stick with this for a while. This entry was posted in Vanity and tagged antioxidants, Coola, make-up, organic, review, sensitive skin, sheer, SPF, sunblock, sunscreen, titanium dioxide, top rated, unscented on January 24, 2012 by jenn. I had not heard of that line of products, so thanks for the rec. The MDSolar has lots of silicones to help with the water resistancy and emolliency (are those words? ), but it doesn’t appear to have antioxidants, which is something I really like in the COOLA sunscreen. But that MDSolar would be handy in the summertime when I’m poolside.